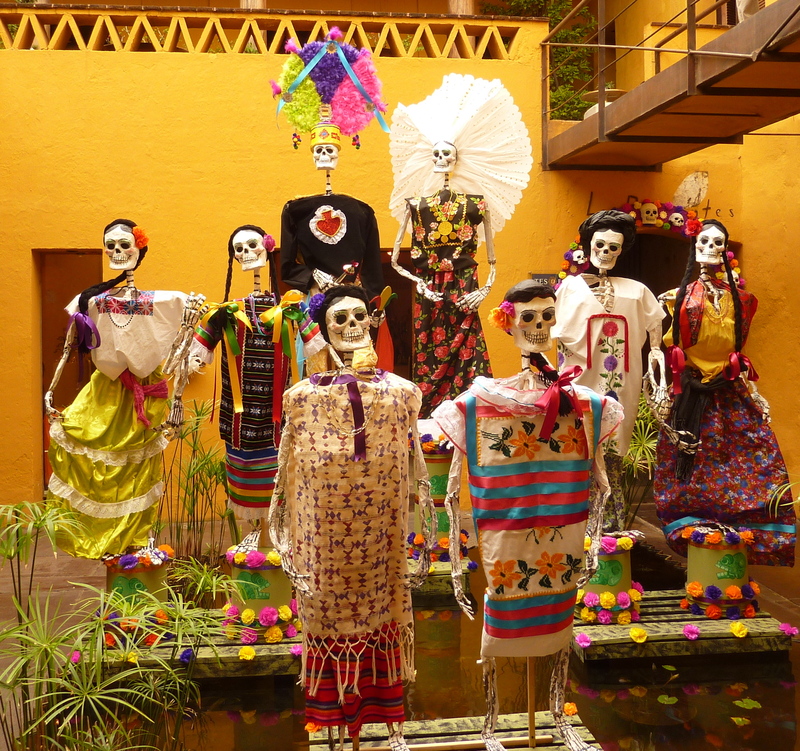 Day of the Dead or Dia de los Muertos is a very magical time of year and a special time for many of us as we remember our loved ones and spend time in their memory. I get a lot of emails asking me where to go in Oaxaca during Day of the Dead, so I thought a blog post was in order. The following is just an idea, and can help you if all the choices get overwhelming. From about mid October: Walk the streets, spotting well-dressed skeletons everywhere; a colourful display of death. Many shops and museums also have altars in the doorways and some streets will a have displays of sand sculptures of skeletons and other deathly scenes. Head to the markets, particularly Mercado Benito Juarez just south of the zocalo, to find a whole plethora of altar decorations. 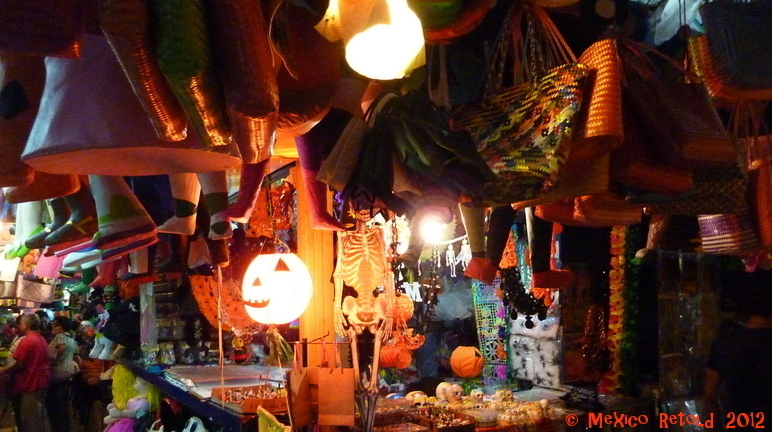 You’ll notice sugar skulls, amaranth and chocolate skulls, incense burners and copal resin, papel picado (Mexican colourful flags) with skeletons cut out of them. Head to the flower section, guided by the strong smell of marigold to find these orange flowers that Mexican’s call Cempazuchitl and the deep purple and velvety feeling Cresta del Gallo. Further on in the bread section you will find pan de muertos, sweet varieties of bread covered in sugar and a slightly more savoury version with little heads stuck on them to look like people popping out of the bread. Grab yourself some hot chocolate and pan de muertos for a warm, sweet treat on these cold Muertos nights. The cemetery in Xoxo (pronounced Hoho) is a very popular place for tourists and has become quite busy in the last few years. Nevertheless if you can brave the crowds and also if you might feel more comfortable in a place very used to tourists, this is a good option. The graves are decorated by the families of the departed and candles are lit as they sit by the graveside in a night-time vigil. It makes for a beautiful site. Late in the day, I would recommend heading the Panteon General, the cemetery in the centre of Oaxaca. 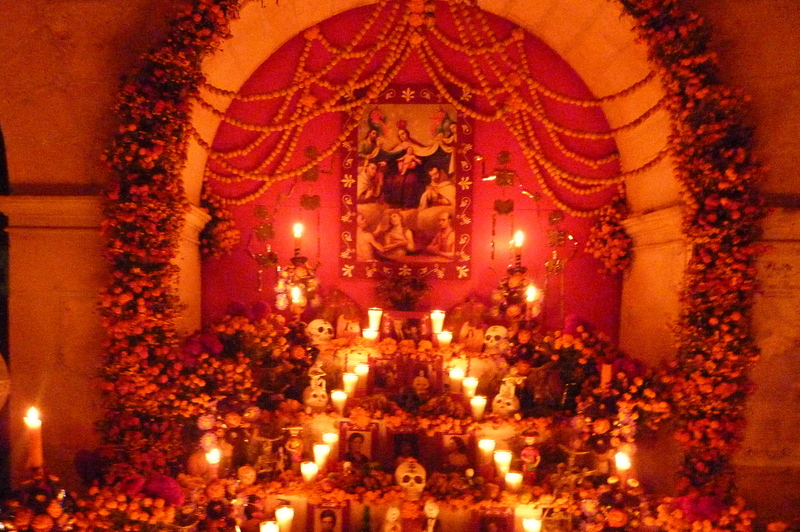 You will find graves, beautifully decorated and be able to walk around and see them in the daylight. 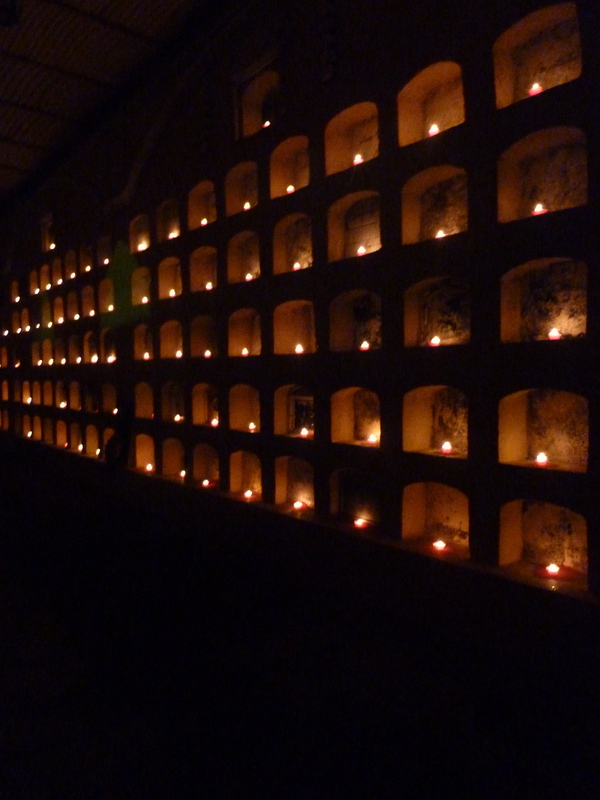 As the light begins to drop you can enjoy the ethereal site of the candles being lit in the niches, and you might even hear an orchestra play. On the 31st there is also the most incredible display of intricate altars around the walkways of the pantheon. 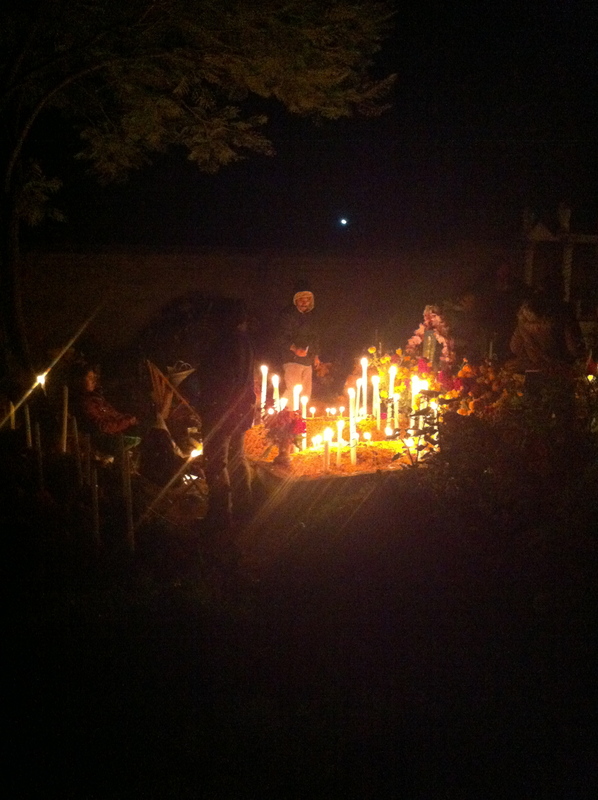 Head to the small town of Atzompa, just outside of central Oaxaca and you will find a graveyard in the process of being decorated (families continue to head to the cemetery through the night). Beautiful graves, lit with candles are attended by local families, who sit around them, spending time with their family members in the world and beyond it. Atzompa, is a quieter more sombre affair, although last year there was a sound system with music later in the evening. To see some of the most impressively gruesome costumes you have ever seen, head out to San Agustin Etla (about 30 minutes by cab from the centre, along the road out to Mexico City). If you get there early you will see all the people in their costumes convening at the church and starting to dance. Drink a hot punch as you explore the churchyard, marvelling at the costumes. As the night draws in and the mezcal begins to flow, the party here really starts. Be warned the party goes on until the very small hours. NB: When I went here a few years ago, getting back wasn’t so easy. You may want to organise for a taxi to pick you up at a designated time if you don’t want to stay for the whole party. Go to check out the large sand sculptures that decorate Plaza de la Danza each year. They are colourful and large scales depictions of skeletons and the like and are very impressive. Last year between 31stOctober-2nd November there were colourful images set to music projected onto a number of the churches, including Santo Domingo, so if that is also on this year it is worth a visit. You will probably also find yourself caught up in a parade or two between the 31st and 2nd, if you are in and around the centre. Have your camera ready! Want to make your own altar for Day of the Dead? Here is my how to guide. 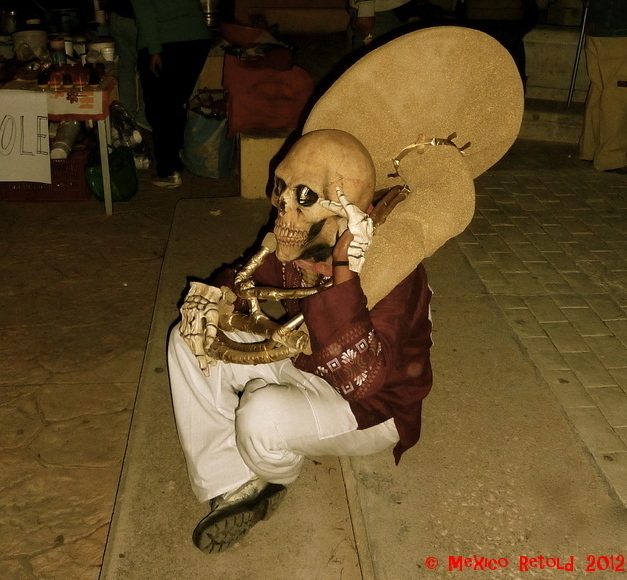 The Oaxaca Lending Library (an English language non-profit organization) offers an array of Muertos tours, both walking and on buses, to several important sites for a fee, part of which benefits the charities supported by the library. See the website. I am so glad. Thanks for the comment Christine! Thanks for sharing this. 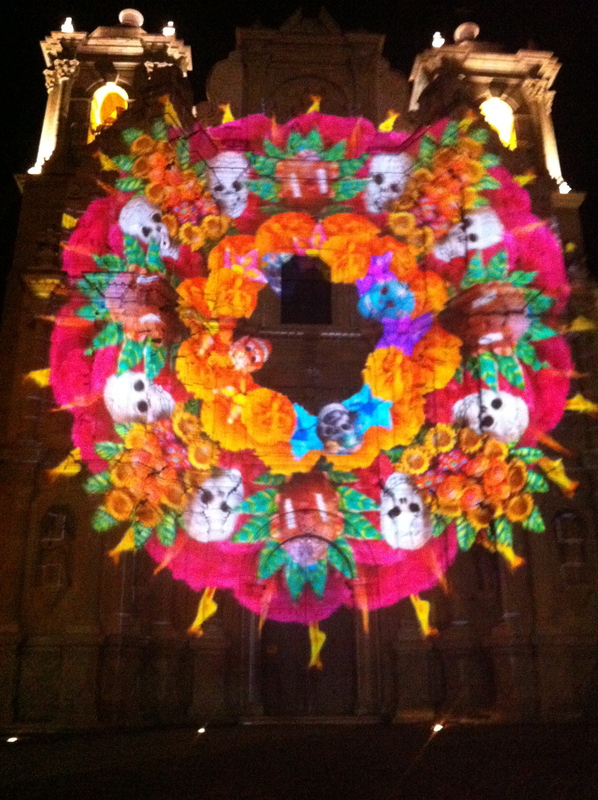 I will be in Oaxaca for 5 days for Day of the Dead. Will you be there this year? Great Jeff, enjoy! I am very sad that I will be out of town this year. Felicitaciones me encantó tu articulo, me hiciste viajar un poco con lo que escribiste. Fascinante cultura. Wow! Muchas gracias Marce. Que lindas palabras! Thank you for your article. 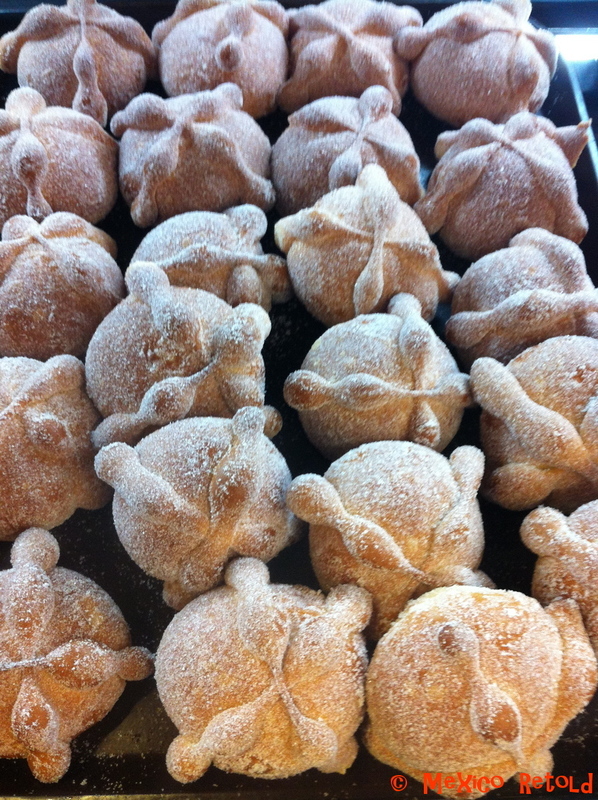 I never knew that the little bumps on the pan de muertos were supposed to resemble heads popping out! I have a slight possible correction: When you talk about the scent of Cempazuchitl on the street, I believe those flowers are called marigolds in English, not magnolias. Though they have a similar spelling.